We have 1" x 8' Natural Bamboo IN STOCK In CALIFORNIA for immediate shipping. Natural Bamboo is sold by the bale (50 pieces each) with a minimum order of 4 bales. Approximate weight 65lbs/bale. FOB is L.A. California, Truck freight. 1" x 8' Natural Bamboo poles, 4+ bales $84.00 per bale, 8+ bales $82.00 per bale, 20+ bales $80.00 per bale, 50+ bales $79.00 per bale. Minimum order is 4 bales. Prices include current 2018 tariffs. 1 1/4" x 12' (28/30) Super Bamboo poles, Natural. Comes in bales of 25 poles each. 6+ bales $80.00 per bale, 10+ $78.00 per bale, 20+ $76.00 per bale. Super Bamboo ships Truck freight ONLY. 6 Bale minimum order. 12' bamboo is shipped in 25 piece bales. Prices include current 2018 tariffs. NOTE: Expect another 15% tariff increase after January 1st, 2019. Freight cost for bamboo is expensive. Sometimes the freight costs are the same or more than for the bamboo itself (Alaska, or some remote U.S. addresses). Our minimum order of 4 bales of 1" x 8' natural bamboo is a minimum of $150.00 for truck freight shipping from Los Angeles, CA to Northern California. 8 bales from L.A. to Sandpoint ID is approximately $180.00. The more bales you buy, the freight cost per bale goes down. So it is always best to email, or call for a freight quote in adance of ordering. Taped Bamboo is “IN STOCK” as of 3/22/2019 in California. We have a limited supply of New, Fresh, Taped Bamboo ready to ship. Red (is SOLD OUT) , We have Blue, Orange, and a large supply of Orange/Black Alternate pattern, with 4” Breaks , Also known as “Panel”. 1" x 8'. SPRING SALE Price is $155.00 per bale. 50 pieces in each bale, 4 Bale minimum order. $150.00 per bale for 40+ bales. 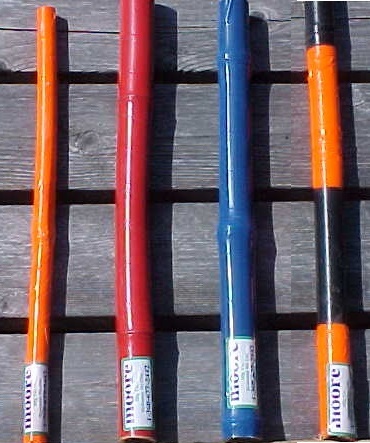 Dapcos standard Snow pole model 3639 is highly visible from long distances. The bright, solid, colored bodies of the poles make them stand out boldly against the snow, even on dark winter days. Skiers easily spot the new fluorescent poles in all types of weather conditions. These poles give skiers advance notice of approaching hazards and closed runs, increase personal safety and decrease liability for property owners. Sold in Bundles of 25. Shipped via UPS or Truck freight (FOB Tacoma, Washington). New Dapco Model #8266, Special order only, Black or Maintenance Orange. Snow Post 1.9" x 10' $ call for price. 1.9"x 12' $ call for price. Accepted for phone, fax orders and the order form. Mooremfg.com does not rent, share, or sell ANY personal information submitted when ordering.